In May 1914, American aviator Theodore Macauley took a Toronto Daily Star reporter for a ride in an unusual flying machine. We would recognize it as a seaplane, but in the years before the first world war the aircraft was a "flying boat"--quite literally an airship. The high powered machines, capable of take-off and landing on water, were expected to become popular--not to mention fast--pleasure craft, perhaps even a viable alternative to the automobile. That year the journey time between Toronto and Hamilton, the nearest major city, was about two hours by steamboat, an hour by motorcycle, or 51 minutes by express train. One Thomas Bigley ran the 70 km distance in a record 6 hours and 31 minutes. At the same time, the Toronto Harbour was abuzz with aerial activity. Two rival flying schools--one run by pilot William A. Dean and the other operated by American Curtiss Aviation--both taught budding pilots how to operate simple Curtiss Aeroplane Company planes. The machines looked a lot like modern biplanes: two parallel wings with a single propellor engine and a little tail fin. Dean's flagship craft, one of several in his fleet, had its pilot seat high up between the wings with the engine it at the rear. It floated on a central pontoon that looked like a giant lake creature poking through the surface of the water. For that reason, Dean nicknamed it "Sunfish." Aviation was still primitive in 1914. The first powered flight in Canada (and the British Commonwealth, for that matter) had only taken place five years earlier, on a frozen Bras d'Or Lake in Nova Scotia. J. A. D. McCurdy, a man with Toronto connections, was at the helm that day, six years after the Wright Brothers first powered flight at Kill Devil Hills in North Carolina. Despite the danger, or perhaps because of it, early aviators were celebrities, and Theodore C. Macaulay was one such early star. Trained at the Curtiss company's own academy in San Diego, California, Macaulay came to Toronto in 1914 to work as an instructor at William Dean's flying school. He brought what was then considered detailed knowledge of aviation: two year's experience. 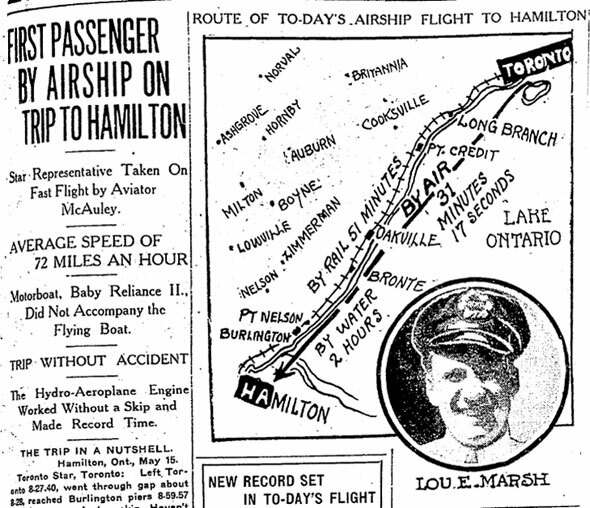 The origins of the 1914 Toronto--Hamilton run aren't clear, but it was most likely a promotional exercise designed to inspire would-be pilots. J. A. D. McCurdy had set the benchmark flying time in 1911, reaching Steeltown in 36 minutes, and Macaulay thought he could get there faster in a newer plane. So it was that Macaulay and Toronto Daily Star sports reporter Lou E. Marsh climbed into the Sunfish on May 14, 1914, some time after 7 am. In anticipation of perhaps meeting a watery end, Marsh took out a new life insurance policy ahead of the flight, but found out too late that it didn't cover flying. He was terrified, much to the delight of the workers at Dean's academy. "Which do you prefer, Necropolis or St. Michael's?," they asked. "What sort of flowers do you like, Lou?" Every day in the lead up to the flight they would solemnly bid him farewell, as if they would never see him again. To add to Marsh's woes, he would have to help Macaulay fly the plane, leaning into steering gear strapped to his body to help make banked turns. Shortly before 8 am, Macaulay took his seat with Marsh, who was "wrapped up like an Eskimo" in a heavy corduroy coat and blizzard cap. "The engine was started, and the big craft lay snorting in the shoals of the Island sandbar at the Western Gap like a big sea monster that was stranded in shallow water," the Daily Star reported. "The engines first purred, and then the roar of the eight big cylinders roared like a mighty cataract." Macaulay shook hands with William Dean and shoved the starting lever forward, sending the wooden propellors into high speed. The plane darted forward across the surface of the Toronto Bay and lifted gently into the sky "like a mammoth gull" on a favourable gust of wind. The pair circled the bay three times before making a westward dash past the Lakeside Hospital at Gibraltar Point, the official start point, and the open water. "The big lake that stretched away to the west was like a mill pond," the Daily Star wrote. "There wasn't a ripple on its glassy surface, and the sun reflected on it as on a mirror." It appears the sensation of flying went some way to calm the Daily Star reporter's nerves. He would later recalled he'd had "more sensation travelling on a fast elevator than on the Sunfish." The plane dipped to buzz a fishing vessel near Oakville, but other than that the flight was uneventful. It took Macaulay and Marsh exactly 31 minutes and 17 seconds to reach the piers at Burlington., three minutes faster than McCurdy managed in his aeroplane in 1911. On touchdown, Marsh, who had just become the first air passenger between the two cities, dashed off a telegram to the Daily Star newsroom: "Phone Mrs. Marsh am O.K.," he wrote. "That was some ride," he told his pilot. In later years, Macaulay fared better than William Dean, who, despite offering competitive prices, was forced to close due to increased competition from his rivals. Macaulay left Toronto in 1915 and became a test pilot with the signal corps and later a major in the U.S. military. The pilot miraculously dodged serious injury in a crash at Beeton, Ont. that broke his leg in two places and twisted his spine so seriously doctors feared he would be permanently paralyzed. The Sunfish lasted until Oct. 1915, when an inexperienced pilot dropped it into the Toronto Harbour. The unnamed man "came [to Toronto] claiming to be an aviator, but he was not, and he dove into the Bay and wrecked a good machine," the Daily Star reported. 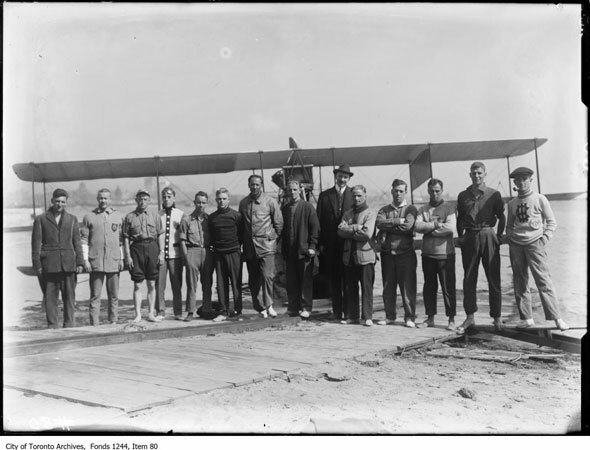 Images: "Flying boat at Toronto Island's Toronto School of Aviation," 1912, City of Toronto Archives, Fonds 1244, Item 80; "Curtiss "F" flying boat, Toronto Island," 1915, City of Toronto Archives, Fonds 1244, Item 4535; Toronto Star, Friday, May 15, 1914, Page 1.